A familiar face to Coronado Playhouse audiences, having performed in Hamlet, Much Ado About Nothing and King Charles III, Samuel Young returns to CPH, this time as the Director. This production markes the first time Coronado Playhouse has ever staged The Winter’s Tale in the 23-year history of Annual Free Classic plays. 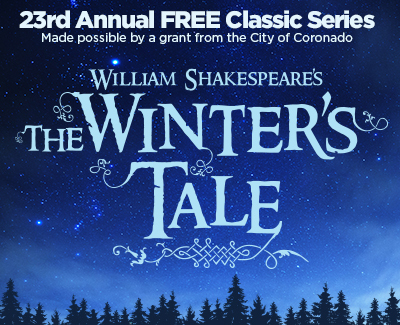 Tickets for The Winter’s Tale are FREE thanks to a generous grant from the City of Coronado. The Winter’s Tale is NOT included in our subscription packages but can be added to a subscription at the time of booking.